At more than two million volumes, the Frank Melville Jr. Memorial Library stands today as the largest academic research library on Long Island. 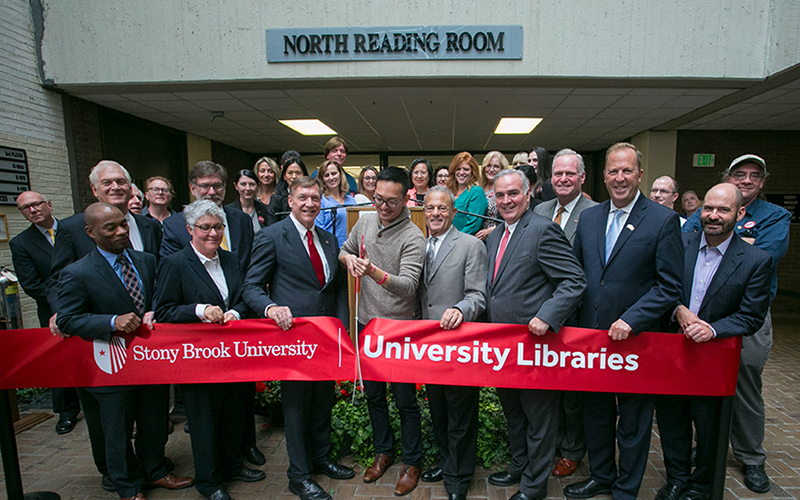 A recent $3 million modernization of the North and Central Reading Rooms has transformed the Library into a centralized, interdisciplinary learning environment: a model for the 21st century university campus. The north room features a 30-seat flexible learning lab; 12 technology-enabled collaboration rooms that students can reserve online; ergonomic seating for individual and group study; optimized lighting and acoustics to enhance focus and learning; and a one-stop service desk that assists students, faculty and staff with library services and functions. The central room is designed to be a community gathering place within the library. It features an event space that can accommodate up to 100 people, a reading nook with magazines and newspapers, two classrooms and group study suites equipped with collaborative technologies. The Stony Brook Foundation Knowledge Commons also provides more conspicuous seating for Library faculty and staff, making them more accessible and available to help visitors.